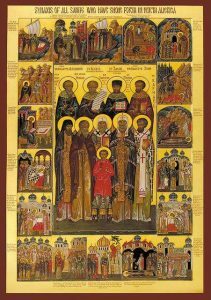 The feast of All Saints of Russia was first celebrated in the sixteenth century, but it soon fell into disuse, except by the Old Believers. It was revived at the Council of 1917-1918. Perhaps we would feel that this is a feast of “nationalistic pride,” for indeed, we celebrated the Feast of All Saints last Sunday, and all Christians, in all times and places, are called to holiness, to live in the grace of the Spirit, to work to bring all into union with God. However, perhaps it is also good to remind ourselves that people can be holy in all eras and cultures, and that there are so many saints walking among us in our own nation and times. In recent decades, many feast of the saints of a particular place or culture have been established – All Saints of Mt. Athos, All Saints of England, All Saints of Greece, All Saints of Carpatho-Russia, and so forth. These feasts have all been established in the Orthodox Church and they commemorate only saints of the Orthodox Communion. However, it has been proposed that one step towards unity would be for us to recognize each other’s saints, to recognize that the Holy Spirit is at work in both our Churches, that the light of Christ in his holy ones shines upon us all, and that we can find God in all places and times. Today, let us remember all Orthodox and Catholic Saints, and, indeed, any human person who has found God and in whom his saving grace resides.